Dark Horse Month was so big, it couldn’t be contained in just one month! Up next: an excellent interview with writer Steve Niles, the creator of such seminal horror comics as Criminal Macabre and 30 Days of Night. With the Criminal Macabre Omnibus Vol. 2 coming out in January and a Criminal Macabre story that just concluded in Dark Horse Presents, now was the perfect time to catch up with Steve and ask him what’s next for Cal! Read on for our exclusive interview! Plus, enjoy an exclusive preview of the Criminal Macabre Omnibus Vol. 2! WARNING: SPOILER ALERT if you haven’t read Criminal Macabre: No Peace for Dead Men. TFAW.com: You created Cal MacDonald more than 20 years ago–how have you changed in that time? Steve Niles: Ha! I think I’ve changed a little more then Cal has. Back when I created him I was probably a lot more like him then I care to admit. Luckily, in 20 years I’ve mellowed. Cal hasn’t, of course. I also find it really fascinating that I was younger than Cal when I started writing, and now I’m older then him. Damn fictional characters age so slow. TFAW.com: Cal, of course, has undergone a major change–he’s dead after the events of No Peace for Dead Men. He seems to think it’s a temporary problem–is it? SN: This has been in the cards for Cal since the beginning. One of the big unanswered questions–through the novels and comics–has been why do the ghouls follow Cal everywhere? Well, now we know why. It might be permanent. It’s up to Cal. He was a werewolf once (See second novel: Guns, Drugs & Monsters) and he got out of that with a little help from the Devil. I know Cal will never give up trying to become human again, but for right now, he’s stuck. TFAW.com: It’s been so funny to see Cal, who’s always been so cranky with the ghouls (and, well, everyone) having to adapt to being one himself. Was this always part of the plan? SN: I have to admit I’m enjoying watching him squirm. Cal has always put a big defensive wall up between himself and the ghouls. Now that he’s one of them he has to find his place in the world. I’m having a lot of fun with Cal right now. TFAW.com: Now that he’s a ghoul, is Cal finally drug free? SN: Not really, but nothing works quite the way it did before. One thing I always try to do is vary what monsters can and can’t do. No two humans are alike. Why would monsters? Cal is going to have one hell of a ride as he works with his new self. TFAW.com: One of my favorite parts of the series is Cal’s relationship with Mo’Lock. Has it ever been explained why Mo’Lock patiently hangs around and takes Cal’s abuse? SN: I get into a lot more detail about Cal and Mo’Lock’s relationship in the novels and short stories. They were brought together by fate and in Savage Membrane we learn that they have a lot in common. There’s nothing really supernatural about their friendship, though. They are just friends. Mo’Lock knows the abuse is just how Cal deals with the world and secretly, I think Mo’Lock really loves the guy. I love the dynamic between them because now they’ve been together so long, they are like an old married couple; they seem to hate each other, but there’s a huge amount of affection behind every barb. TFAW.com: You’re always involved in a lot of different projects–you currently also have the new 30 Days of Night and Wulf on your plate, as well. Where does Criminal Macabre fit in for you? What itch does it scratch, compared to your other projects? SN: I don’t want to say writing Cal is easy, but he is the most comfortable character to write. Cal is like going home for me. I can always slide into his shoes and look at the world through his cynical eyes, and it just flows. Cal is an absolute priority for me. He’s my favorite child. There I said it. I hope, hope, hope that this new team can stay together for awhile and eventually go to series again. TFAW.com: The Criminal Macabre/Goon crossover one-shot was fantastic. What other series/characters would you like Cal to “visit”? SN: Well, the guest appearance from Hellboy was a big hint. I’d love to have Cal and Hellboy team up for a story. It would be fun because I don’t think they’d get along at all. The Criminal Macabre/Goon crossover was a lot of fun. It’s probably the silliest story I’ve ever written, but that was the point. Crossovers are tough, because usually the story is pretty weak. I wanted to just get these two smart-asses in trouble as soon as possible because all the fun came out in their interaction. I wrote a really rough script, and then Powell came in and tweaked Franky and the Goon. It was just plain fun, and I hope that comes across. 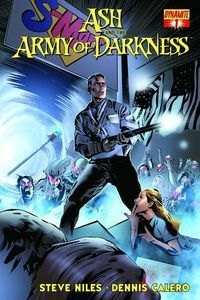 TFAW.com: I could kind of see him as a love interest for Buffy for three issues or so–she’s dated the undead before, and Cal seems like less drama than Angel. Can you make that happen? SN: Isn’t Buffy in High School? This is Twilight, ya know? TFAW.com: When you started out, did you ever think you’d have enough Criminal Macabre stories for two omnibusses? SN: Honestly, no. I never thought the character would catch on at all. I wrote Cal for fun long before anything would ever see publication, so it’s very strange to see everything being collected now. But I’m very happy, too, because with the new collections, a new generation of readers are discovering the stuff, and there’s a lot to give them! TFAW.com: Why did you choose Dark Horse for Criminal Macabre? SN: I’ve known Mike Richardson since I was a kid, and being published by Dark Horse was always a big deal for me. They were the first to publish Cal back in DHP in the ’90s, so when I pitched a series DH seemed like the logical home for it. That and DH gets what Cal is, and they have always been big supporters of the character and me. TFAW.com: Are there plans for more Criminal Macabre after “Die, Die, My Darling” concludes in DHP #6? SN: Part one is already in the can and I send off the script for part two in . . . aw jeez, I’m late. Gotta go write Cal!! Our thanks to Steve for taking a break to answer our questions! 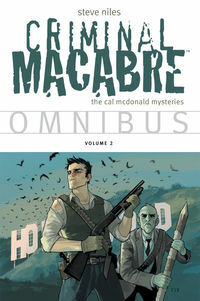 Make sure to pre-order the Criminal Macabre Omnibus Vol. 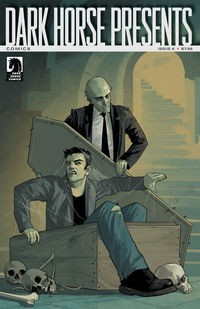 2 and pick up the latest Cal story in Dark Horse Presents! Can you believe that Cal is a ghoul? Are you looking forward to more of his story? Post your comments below! 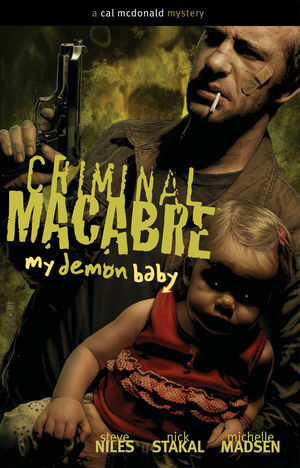 I couldn’t wait to get into the office to post today’s featured horror book, Criminal Macabre: My Demon Baby, which you can get for just $9.99 (sale good today only). 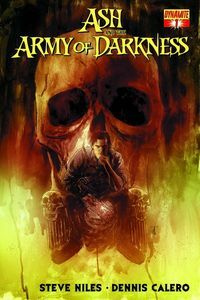 Collected in this TPB is one of Steve Niles’ funnest Cal McDonald romps. To say that Cal’s been through hell and back would be a misstatement. He’s been to hell, all right, and he seems to be stuck there for good. When we last checked in on Cal, he and Mo’Lock had just witnessed the vile, horrifying transformation of Cal’s lovely ex, Sabrina Lynch, into a minion of the vampire Nosferatu. After that Cal disappeared for a bit, and at the start of our new series, Mo’Lock finds him just in time to lure him off the filthy couch in an abandoned house with an offer he can’t refuse-either he gets up and takes a new case, or Mo’Lock will kill him before the drugs can. And what a case it is. Devil worshipers in sunny SoCal are doing their best to bring Satan into the world, and by the looks of things, Cal’s already too late. What does one feed a bouncing baby Beelzebub, anyway? A mixture of supernatural horror, noir-type investigations, undead foes and rampant drug use, Criminal Macabre is pretty cool title to fall into if you haven’t already discovered it. Check out other great horror titles on our Horror Month page!